During my recent trip to China and Taiwan, I not only spent time with Intel's executives at the Intel Developer Forum in Shanghai, but also visited several manufacturers in Taiwan on the second leg of my trip. We've already had brief looks at what Cooler Master, Lian Li and Gigabyte have in the pipeline. Today it's time to look at two soon-to-be-released motherboards from MSI, the P45 Platinum and the K9A2 Diamond. It will come as no surprise that the former is based on Intel's up and coming P45 chipset, while the latter is based on Nvidia's nForce 780a SLI chipset, whose release is imminent. Before we get onto that board though, let's have a look at the P45 Platinum. 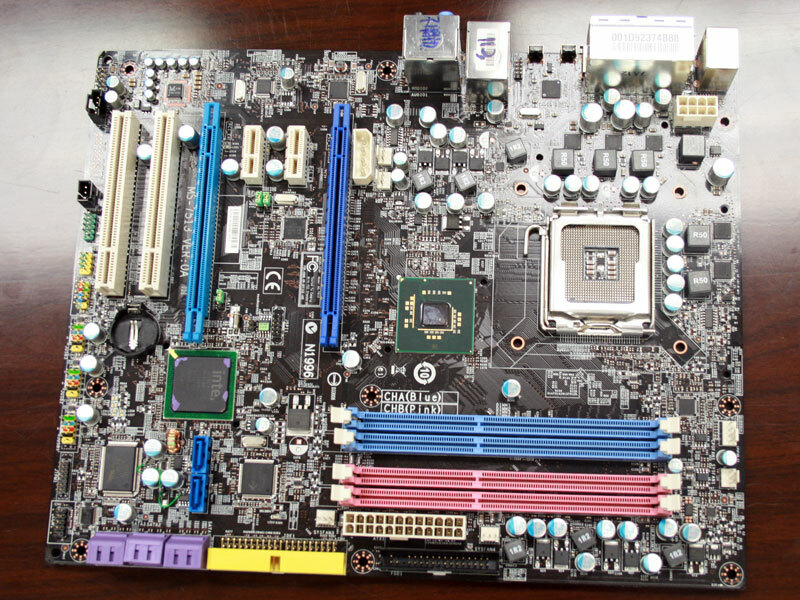 MSI has based its new P45 motherboard around what it is calling DrMOS technology. 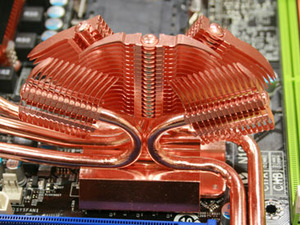 This, the company says, is designed to enhance power delivery to the CPU through the five phase design. However, instead of having a collection of traditional MOSFETs under the heatsinks, MSI uses just a single chip per phase. Each of these features one hi-side MOSFET, one lo-side MOSFET and a driver – combined, MSI claims that they produce less heat than a traditional design and it makes the PCB layout a lot simpler. However, what's curious is that the company has opted to use traditional power circuitry on other parts of the board. Both the northbridge and memory have two phases each, which should enable smoother power delivery and fairly fine voltage control on these parts of the board – this is enhanced over the company's P35-based boards. 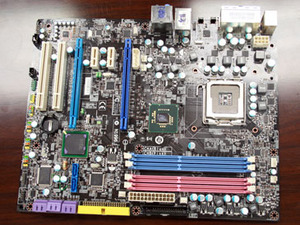 The overall layout is a good one from MSI and there aren't any really tight spots on the board. 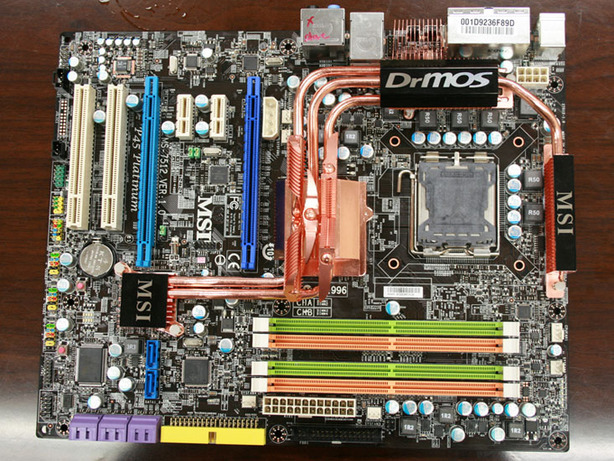 Probably the tightest area of the board is right above the top PCI Express slot, where there are two three-pin power connectors and a four-pin Molex connector right next to the three heatpipes connecting the northbridge to the first block of CPU PWM circuitry. 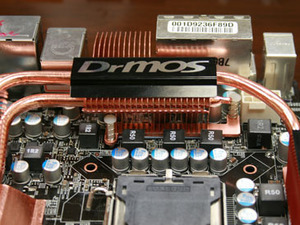 The eight SATA connectors are all free from obstruction—even with two dual-slot, full length graphics cards like the Radeon HD 3870 X2 installed in the board. The six controlled by the ICH10R southbridge are rotated 90 degrees so that cables are plugged parallel to the board, and the lone PATA connector is also rotated as well. 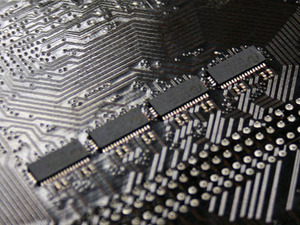 Curiously though, the remaining two connectors—which, combined with the PATA port, are controlled by a third party chipset—are not rotated by 90 degrees. Interestingly, MSI's engineers told us that, despite being a smaller physical size, the P45 northbridge is around 10 degrees hotter than the P35 northbridge. 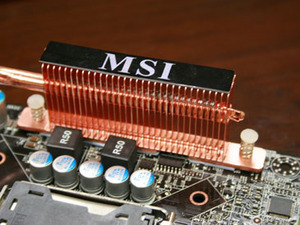 As a result, MSI have reinvented the elaborate northbridge cooler again with the monster fitted to this particular board. 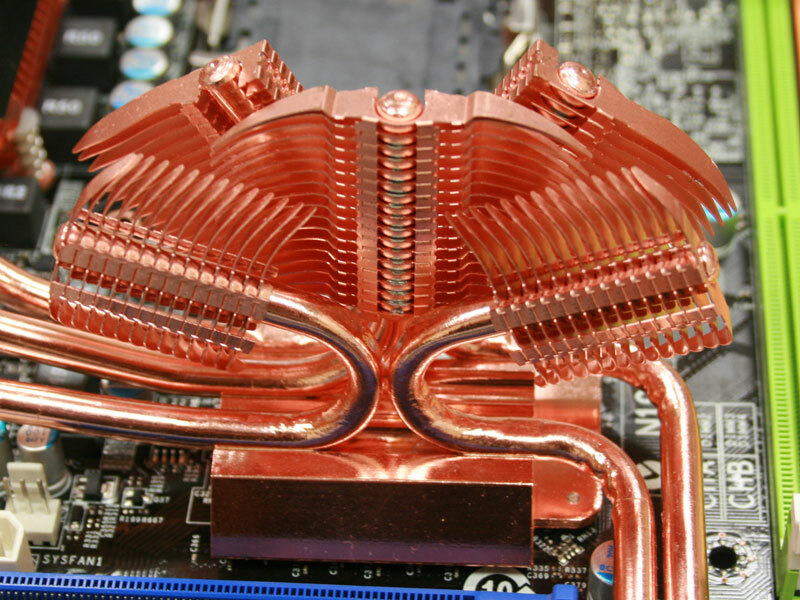 It features five individual heatpipes that all run out to independent arrays of fins. What's more, MSI said that its BIOSes are generally not as feature rich as some of its competitors', but it's making up for that with the introduction of a hardware-based northbridge strap. 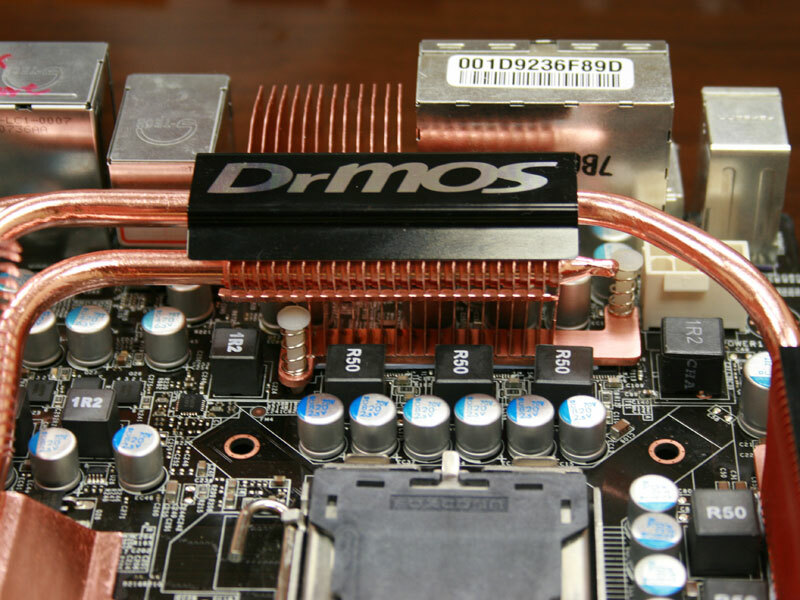 It believes this is a better solution than the software solutions you see elsewhere and it signifies the return of the motherboard jumper – as you'll need to configure the northbridge timings via the two jumpers in between the PCIe slots. Finally, while we're talking about the PCI Express slots, it's worth mentioning that they support CrossFire. 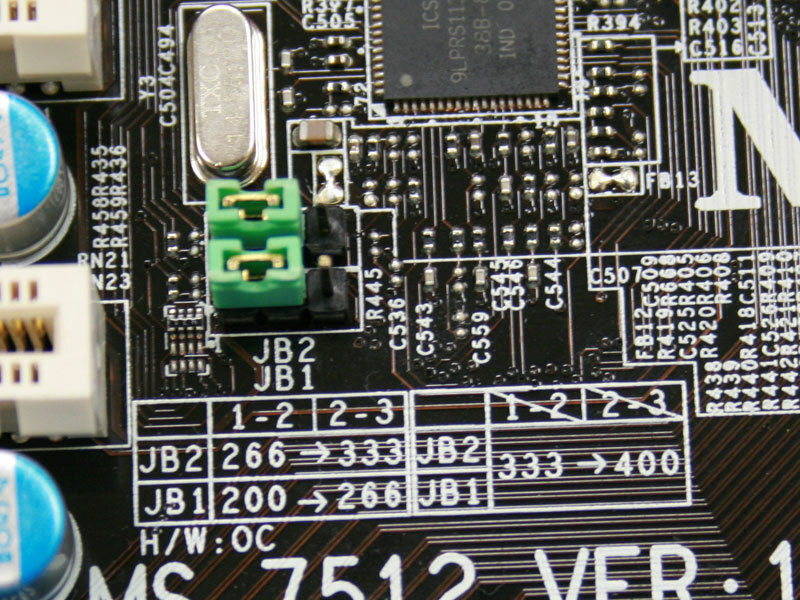 This is thanks to the line of digital switches located on the back of the PCB – MSI says that because it has used a four layer PCB, it was infeasible to put these on the front side of the board (not that it matters).